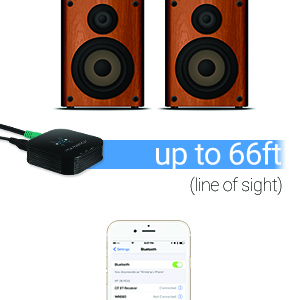 Enjoy high definition music wirelessly through your Hi-Fi or home audio system. Powered by Bluetooth V4.2 technology, the HomeSpot Bluetooth Receiver uses high-end aptX and AAC audio streaming codecs and an audiophile-grade digital audio converter to unleash all the clarity, crispness and full emotional impact that your Hi-Fi stereo system can deliver. Unlike standard Bluetooth receivers, HomeSpot provides extended wireless freedom with the longest wireless range of up to 20m / 66ft. The HomeSpot Bluetooth Receiver supports the AAC, SBC, Qualcomm aptX and aptX Low Latency codecs. aptX supports music resolutions of up to 24-bit/96kHz which is actually better than the quality of audio stored on CDs which is 16-bit/44.1kHz.aptX is enabled in Android devices from Samsung, HTC, LG, Motorola and Sony. It has has been supported in Android since version 4.4 and is also supported by Mac OS, BlackBerry, Intel and Microsoft. You don’t need to spend a fortune for Bluetooth speakers or Bluetooth headphones to get the sound quality of an audio or video experience of the aptX Low Latency codec. The HomeSpot Bluetooth Receiver and HomeSpot Bluetooth Transmitter both have aptX Low Latency built in, so you can turn any older audio device into a modern Bluetooth-ready system. No more sync issues! Now you can privately watch late night TV shows, movies, Netflix or play games without disturbing the people near you. Just connect the HomeSpot Bluetooth Receiver with the HomeSpot Bluetooth Transmitter to have the total aptX Low Latency experience. aptX Low Latency for Bluetooth offers a total end-to-end latency of approximately 40 milliseconds (ms). That’s far less than the standard Bluetooth latency of more than 150 ms (+/-50ms), and it meets the 40 ms standard recommended latency for audio/video applications. The long range coverage with freely up to 20 meters (66 feet). Cover your room with comfortable HD audio reception and connection with clarity sound quality. 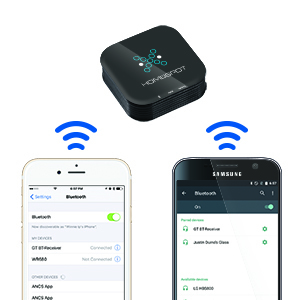 The HomeSpot Bluetooth Receiver enables two mobile phones to connect simultaneously via Multilink technology. Once connected either user can play the music stored on their phone via the stereo system. 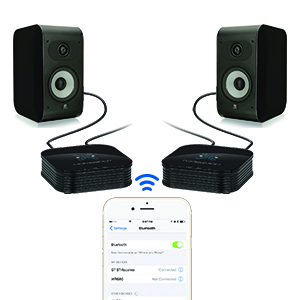 Two HomeSpot Bluetooth Receivers can be connected to each other to create a true wireless connection. You can stream audio to both speakers via Bluetooth for synchronized audio playback.